Update, December 14: The first DLC adventure for Wolfenstein II, The Adventures of Gunslinger Joe, is available now. 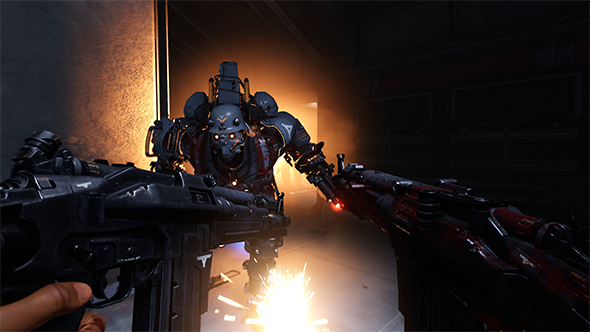 Just can’t get enough of the glorious gunplay and pulpy heroism of Wolfenstein? The game’s first bit of DLC is available now, following the exploits of former pro quarterback Joseph Stallion in The Adventures of Gunslinger Joe. Find out how MachineGames brought the guns of Wolfenstein II to life. The Adventures of Gunslinger Joe is available now for $9.99 / £7.99 / €9.99, or as part of the Season Pass. The update is a 5.1GB download on PC. Original story, November 13:Wolfenstein II: The New Colossus is out, it’sexcellent, and you should probably play it. But what if you already have, and you’re looking for more Nazi-rocking mayhem? You won’t have to survive on the scraps ofchallenge missionsmuch longer, because Bethesda have announced the full plan for upcoming DLC releases. Episode Zero, introducing the pulp hero cast that will star through the rest of the content, is available now, either as a pre-order bonus or part of the season pass. Here’s what’s to come. If taking some real American heroes into battle against the fascists sounds like a good time, the season pass is available for $24.99 / £17.99 / €24.99.